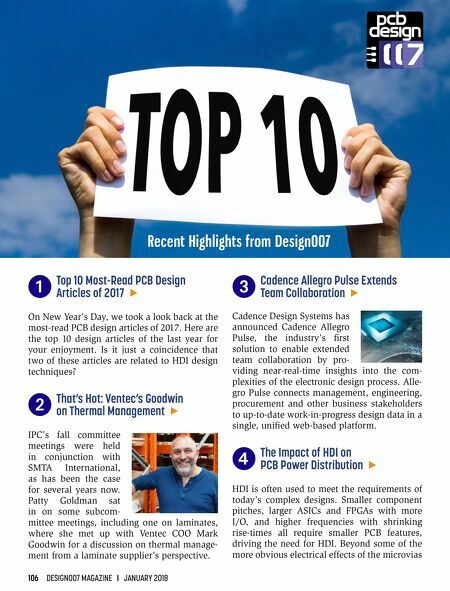 JANUARY 2018 I DESIGN007 MAGAZINE 107 used on HDI designs, there is also an impact to the power integrity the PCB. 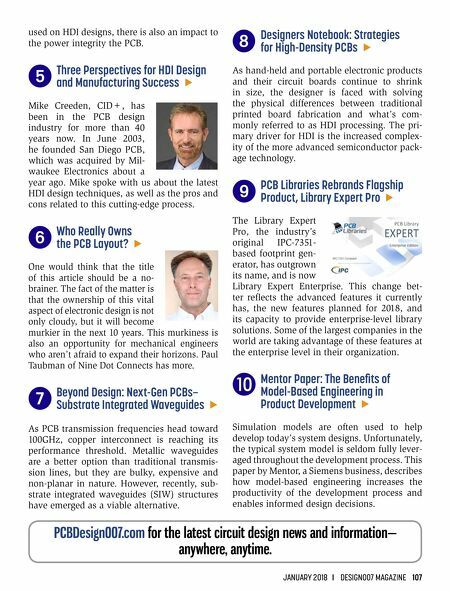 5 Three Perspectives for HDI Design and Manufacturing Success E Mike Creeden, CID+, has been in the PCB design industry for more than 40 years now. In June 2003, he founded San Diego PCB, which was acquired by Mil- waukee Electronics about a year ago. Mike spoke with us about the latest HDI design techniques, as well as the pros and cons related to this cutting-edge process. 6 Who Really Owns the PCB Layout? E One would think that the title of this article should be a no- brainer. The fact of the matter is that the ownership of this vital aspect of electronic design is not only cloudy, but it will become murkier in the next 10 years. This murkiness is also an opportunity for mechanical engineers who aren't afraid to expand their horizons. Paul Taubman of Nine Dot Connects has more. 7 Beyond Design: Next-Gen PCBs— Substrate Integrated Waveguides E As PCB transmission frequencies head toward 100GHz, copper interconnect is reaching its performance threshold. Metallic waveguides are a better option than traditional transmis- sion lines, but they are bulky, expensive and non-planar in nature. However, recently, sub- strate integrated waveguides (SIW) structures have emerged as a viable alternative. 8 Designers Notebook: Strategies for High-Density PCBs E As hand-held and portable electronic products and their circuit boards continue to shrink in size, the designer is faced with solving the physical differences between traditional printed board fabrication and what's com- monly referred to as HDI processing. The pri- mary driver for HDI is the increased complex- ity of the more advanced semiconductor pack- age technology. 9 PCB Libraries Rebrands Flagship Product, Library Expert Pro E The Library Expert Pro, the industry's original IPC-7351- based footprint gen- erator, has outgrown its name, and is now Library Expert Enterprise. This change bet- ter reflects the advanced features it currently has, the new features planned for 2018, and its capacity to provide enterprise-level library solutions. Some of the largest companies in the world are taking advantage of these features at the enterprise level in their organization. J Mentor Paper: The Benefits of Model-Based Engineering in Product Development E Simulation models are often used to help develop today's system designs. Unfortunately, the typical system model is seldom fully lever- aged throughout the development process. This paper by Mentor, a Siemens business, describes how model-based engineering increases the productivity of the development process and enables informed design decisions. PCBDesign007.com for the latest circuit design news and information— anywhere, anytime.